This is the third year of the cycle, so we will be performing nearly the entire work with orchestra. The performance will be on Sunday, December 6, at 2:00 pm. 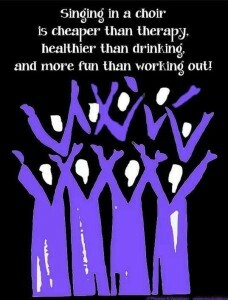 Hope to see you at rehearsal, or the concert….it’s not Christmas without the Messiah! We look forward to seeing you in the audience this Sunday! Save the date! 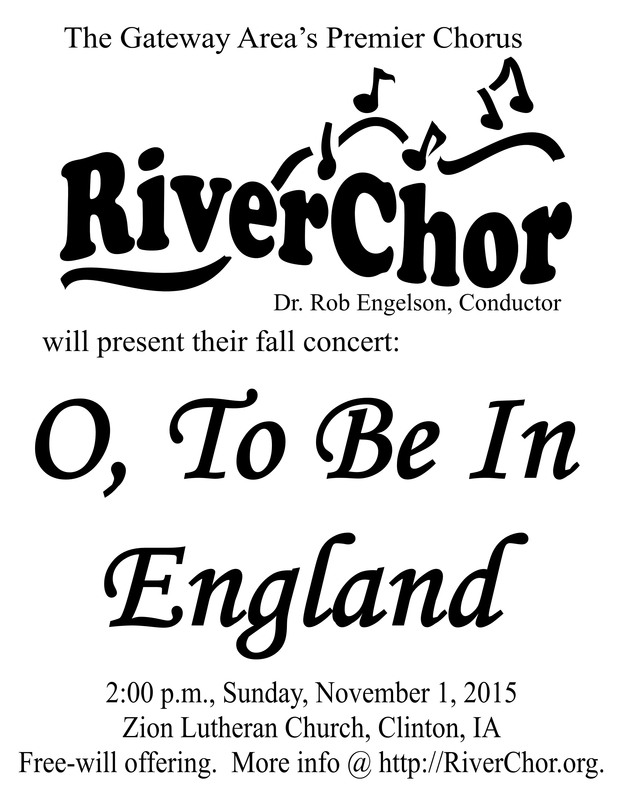 RiverChor will present their fall concert on Sunday, November 1, at 2pm at Zion Lutheran Church in Clinton. Entitled ‘O, To Be In England’, the concert will feature works by English composers. If you’d like to help us promote the concert, simply click the link below for a PDF of our poster, which you can print and post. It’s time for auditions! Stop by Zion Lutheran Church in Clinton, IA anytime between 1-3pm on Sunday, August 30th. There is no need to prepare anything, our director will ask you to sing a few simple things to get an idea of your range and ability. The audition will take about 10 minutes. The RiverChor 2015-2016 season will start rehearsals this Monday, August 31, at 7:00p.m. in the Great Hall of First Presbyterian Church in Clinton. Come in the door facing the parking lot and proceed up the stairs or elevator. Christ lag in Todes Banden BWV 4 is an early cantata of Johann Sebastian Bach, and was likely intended for an Easter performance in 1707. It is a chorale cantata, with music and text based on the hymn of the same name by Martin Luther. There are seven movements, and it will be accompanied by strings. RiverChor is also excited to present Robert Schumann’s Er, der Herrlichste von allen. This piece has been newly arranged for three part women by Dr. Thea Engelson. Mark your calendar now so you don’t miss this concert! It will be Sunday, April 19, 2015, at 2:00P.M. in Zion Lutheran Church in Clinton. The concert is open to the public, a free will-offering will be taken to defray the cost of music and musicians. We hope you can join us. You are welcome to print this poster and put it up (click on it, it will open in a new page), we work on DIY advertising! Be a part of a long standing Clinton tradition….it just isn’t Christmas without the Messiah. Rehearsal for the annual Clinton community performance of the Messiah will begin tonight, Nov. 3rd. 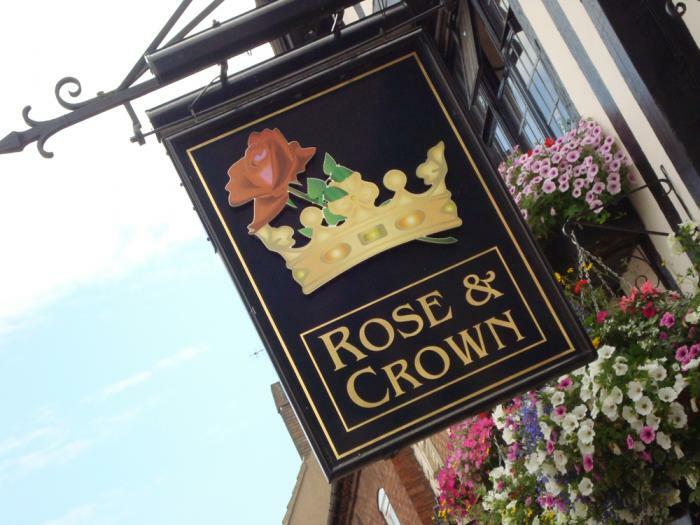 Community singers of any age and ability are encouraged to join us, music will be available. Rehearsals will be on Monday evenings at 7 p.m. in the Great Hall of First Presbyterian Church, 400 Fifth Ave. South. This is the second year of the three year cycle, we will perform Part I, plus selections from Parts II and III, with piano. 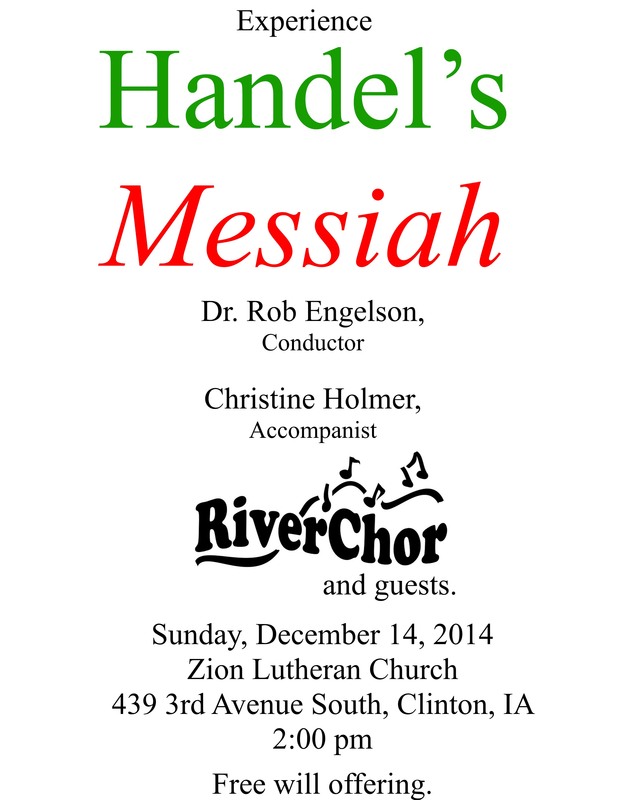 We need an audience, also….so if it just isn’t Christmas without the Messiah, please plan to join us on Sunday, December 14, 2 pm at Zion Lutheran Church in Clinton, Iowa. RiverChor will begin its 11th season of operations with its annual fall concert Sunday, November 2, at 2 p.m. at Zion Lutheran Church, 439 Third Ave. South. The concert is free and the public is cordially invited; free will offering plates will be provided. The concert, entitles “Mozart and More”, will feature Mozart’s Mass Number 15 in C Major, K. 317, known as the “Coronation Mass”. First performed on Easter Sunday, 1779, the work got its nickname from the Austrian imperial court in early 19th-Century Vienna, when it was the preferred music that was performed for imperial coronations. The concert will open with three sacred anthems, performed from the balcony: “Ubi Caritas” by Ola Gjeilo; “O Lord God” by Pavel Tschesnokov; and “The Lord is My Light” by Horatio Parker, performed with our guest organist, David Gaulrapp. Following intermission, the choir will present a varied set of works on the subject of love: an arrangement of the Scottish folk song “Annie Laurie”; “The Pasture” (from Frostiana) by Randall Thompson, featuring the tenors and basses; “At Last”, featuring the sopranos and altos; and “A Summer Night, and You, and Paradise” by Benjamin Kornelis, with a text by popular radio personality Garrison Keillor. The concert will conclude with three songs of faith: Larry L. Fleming’s arrangement of “Lord of the Dance”; “Swing Low, Sweet Chariot”, arranged by Peter Knight; ad the spiritual “King Jesus is A-Listenin'”, arranged by Ken Berg. 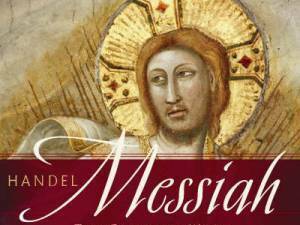 Following the concert, RiverChor will begin rehearsals for Clinton’s annual performance of Handel’s “Messiah”, which will be held Sunday, December 14, at Zion Lutheran. 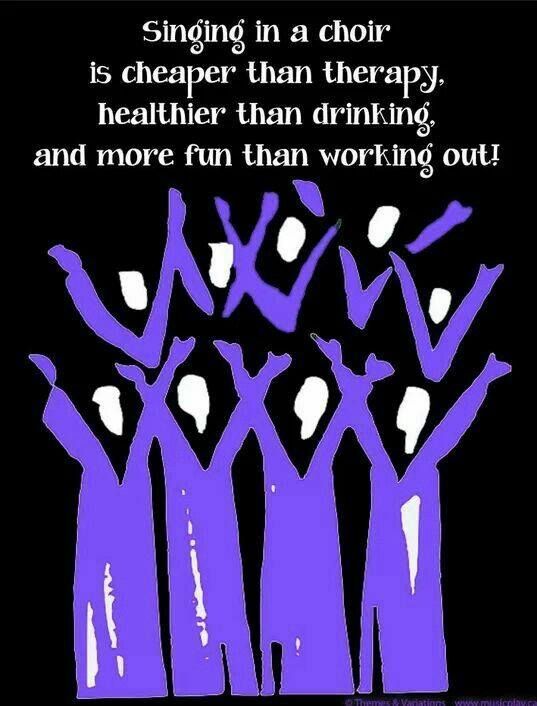 Any interested community singers are invited to join the choir at its regular rehearsals, held Monday evenings at 7 p.m. in the Great Hall of First Presbyterian Church, 400 Fifth Ave. South. RiverChor is in rehearsals for their fall concert, which will be Sunday, November 2, 2014 at Zion Lutheran Church. The concert is free. Repertoire will follow two basic themes, music for Kings, and music of love. Please mark your calendar for November 2, we enjoy singing for you!